Believe it or not, but an evergreen course funnel is not made to sell every course. Before I expand on this, if you need any explanation of what an evergreen course funnel is, check out this definitive guide on the matter. Basically, it’s an automated system to help you sell your online course every day. Will this work for every type of course? The truth is, no. It does not work for every course. BUT, it is a strategy every course should work toward. If you are selling a course that is below $100, then you don’t need an automated webinar and 5 email sequences to sell it. You don’t need to try so hard if you’re selling a cheaper course. But as you continue to add more to that course and increase its value, you should find better ways to sell it every day. 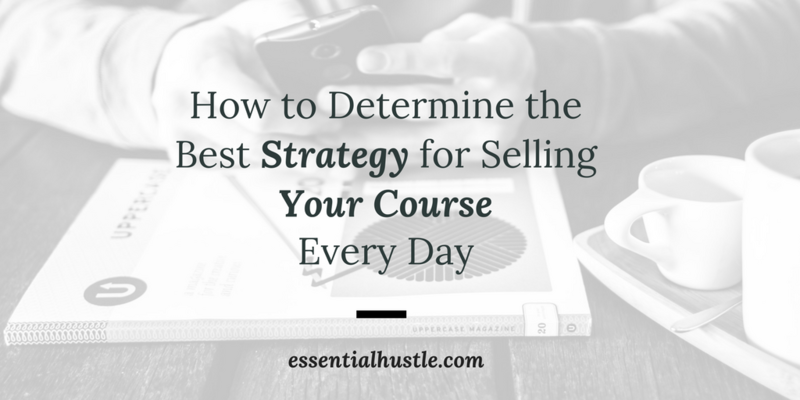 The strategy you implement to sell your course must match the value of the course. At what price point does an evergreen course funnel (like how I explained it in the last article) make sense? If your course isn’t priced high enough to fit with the evergreen course funnel model, then what system do you need to sell your course? How to tell if your course needs a different system built for it to sell more? I’ll answer all these questions and more inside this article, which is all about finding the best strategy for your course. Pricing determines everything about how to sell your online course. In the last article, we broke down what price range your course should fall within. Now, let’s talk about how the price determines the best way to sell your course. One flat price with an email launch. Packages with an automated webinar. Payment plans with a full evergreen course funnel. The strategy you use will largely depend on your price. So let’s dive into each! BONUS: [thrive_2step id=’1427′]Click here[/thrive_2step] if you want my FREE master guide and project workflow template to guide you on building a FULL evergreen course funnel! I mentioned this earlier, but if your course is priced below $100, then you do not need a full evergreen setup to sell it. Why? Because the course falls within the impulse buy range. The impulse buy range is a place where a person doesn’t have to think twice before he or she buys. Also, in this range, the person typically does not have to consult with his or her spouse beforehand on the purchase. The best way to sell a course that is priced below $100 is with a simple email launch. A person joins your email list through a lead magnet. You deliver content in the form of email. After delivering content, you make your pitch. You wrap your pitch in a scarcity offer (ex: this offer will only be available for the next 3 days). Time and time again, I see people think they need some advanced strategy to sell a course worth $29. But in reality, you just need to send an email. If you want to use this strategy, plan on writing at least 5 emails. In the first email, you’ll tell your new subscribers what to expect from you. In the second email, you’ll tell your backstory. In the third email, you’ll reveal the big idea that changed everything for you (as it relates to your product), and you’ll make a soft pitch for your course. In the fourth email, you’ll show what your life looks like now that you’ve discovered your big idea and make a harder pitch for your course. And in the fifth email, you’ll state the scarcity offer behind your course. Notice how in these emails, there isn’t much teaching. This is because we’re delivering value through your own story. Truth is, people don’t need to be educated as much as they need to be inspired. If you can inspire a person of what life could look like for them, then your impulse buy sale is guaranteed. Once your course spans into the $100-$500 range, then you need a more high-touch solution to sell your course. In other words, people will need to see your face and hear your voice through an automated webinar. By revealing yourself to your audience, you break down a bit of this trust barrier. You show you’re a real human being with no self-serving agenda. This is why webinars are powerful tools for selling higher-priced courses. People can see, hear, and interact with you. A person signs up for an automated webinar. They get emails prioritizing their attendance to the webinar. They watch the webinar and arrive on a sales page where the offer is broken down into 3 packages. They have a 5-day window following the presentation where they can buy. This is similar to the evergreen course funnel. Only difference is, we’re not relying as heavily on segmenting our attendee’s behavior. With this simple automated webinar setup, you can bring everyone through to the 5-day launch window if you want. Here’s why: you’re selling your course with packages. Packages are different offerings for your course. Your cheapest offering will be Package #1, your middle offering will be Package #2, and your BEST offering will be Package #3. The reason we’re dividing up your course into packages is because we want to make more money. A person might not be able to afford a $500 dollar offer, but if you took some things off the table and offer your course at $200, then they might be able to afford it. Whenever you have packages selling your course, the goal is for most people to buy your middle offer. If most people are buying your lowest package, you know you’re offering too much value in your lowest offering. If a lot of people are buying your top package, then you know you’re charging too little for what you’re offering. The middle package is the sweet spot—the offer most people should buy. Because you’re offering your course in the form of packages, it’s okay to bring as many people as possible into your launch window. A one-time price with 3 different buying options isn’t asking for too much. A person who really wants your offering will make it work, even if they haven’t watched your webinar. This is the mother of all strategies. And if you’re smart with this strategy, you can run your entire business off this one automated system. This system works best for a premium course that is priced $1,000 and above. The main reason you should be working up to incorporating this strategy into your business is because of payment plans. You see, the problem with selling courses as a one-time price is you build no recurring revenue. You can have a strong sales month one month, and then have the next month completely tank. With payment plans, you can guarantee the same income coming in the next month. This builds your monthly recurring revenue. And though this income has a cliff to it, you’re still expecting money to build on itself from month to month. With this strategy, your income will snowball and multiply. And as you increase your revenue from month to month, you can also increase your ad spend, making this the ultimate selling strategy. But here’s the deal: payment plans are only truly worth it if they’re attached to a high offer. If you are selling payment plans for a $300 course, the most you can guarantee income for is about 3 months ($99/3 months) for this strategy to make sense. But if you are selling a course worth $1,000, you can have a payment plan of $99 for 12 months (people would save money if they paid in full). Or you could even do $199 for 6 months. Coupling payment plans with premium-priced courses guarantees you keep your income for longer. And since you are selling a premium-priced course, then you need to be strategic with your nurture. This is why a full evergreen course funnel, as explained in this article, is best for this offer. I believe every business should work toward selling a premium-priced course with payment plans. But this doesn’t mean I suggest you start here. Start with a course that sells below $100. Sell it with a simple email sequence. Then, add more value to this course and re-release it with an automated webinar setup. Then, add more value to this course, and tweak the automated webinar setup to become an evergreen course funnel selling payment plans. If you are nowhere near building the full evergreen course funnel, no worries. You’ll still get value inside my Double Your Course Sales course. Double Your Course Sales is a library you can continually reference as you work toward selling a premium-priced course. You can learn how to build the simple email sequence, the automated webinar funnel, and the evergreen course funnel, all inside Double Your Course Sales. Early access to the course is available for a limited time. Soon, the price will increase to $997. So if you plan on building a system to sell your course every day, this is your best chance. For now, determine what the best strategy is for selling the course you have (if you have one). If you need help, bookmark this article for future reference.